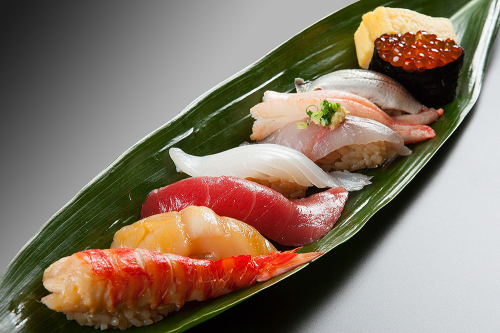 Company Name: Oshima-kan Co., Ltd.
Our ingredients are specially selected natural fish from Japanese waters. Our sushi rice features a blend of red vinegar and rice vinegar seasoning to create our authentic Edo-style sushi, which is very rare in standing-style sushi bars. In our eat-in space, in addition to very affordable single portions starting at 80 yen, we have installed a touch-panel order system at each table available in four languages (Japanese, English, Chinese, and Korean) to make it easy for overseas visitors to order sushi. Orders can be made even from single portions, and our customers can enjoy authentic Edo-style sushi in our standing-style sushi bar in Okonomi Yokocho while experiencing the spirit of traditional Tokyoites. Our take-out menu includes hand-pressed Natural Bluefin Tuna and Red Vinegar-Seasoned Scattered Sushi Mix, and our eat-in space prides itself on authentic Edo-style sushi to delight our customers.